Saturn Explored, maple, 50mm high x 535mm dia. 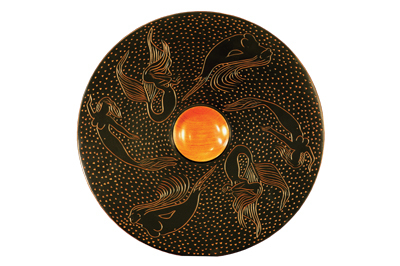 Mermaids at Play, bubinga, 50mm high x 355mm dia. 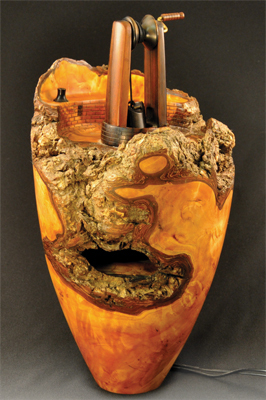 Ye Mine of Old, maple burl, Macassar ebony, tigers eye stones, leather, lights, 405mm high x 215mm dia. Open Root Form, locust, 200mm high x 355mm dia. 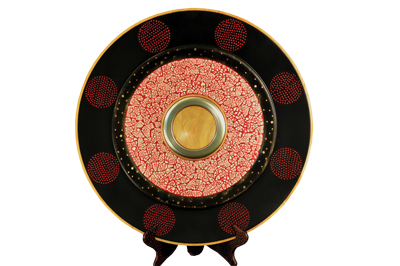 Dennis is a turner of many talents, producing a variety of items from hollow forms all the way through to embellished platters. Some of his pieces are incredibly detailed such as 'Ye Mine of Old', which uses semi-precious stones. I started by asking Dennis to give me a run down of his background, and I discovered that he has been turning for over 40 years. He explains that he got the opportunity to enjoy the craft on three different continents, while watching it mature into a true art form. 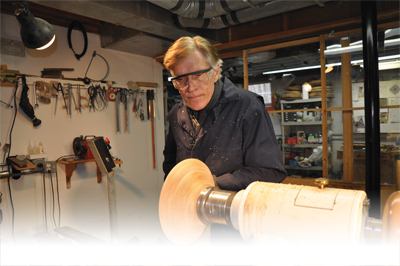 When I asked Dennis about how he came to discover woodturning in particular, he comments that it all started at Pretoria Boys High school in South Africa in 1966 where, as part of his eighth grade school woodwork project, he was required to turn a lamp stand: "This item still stands in my studio as a memory of those early beginnings. It received a failing grade, but for me that was not at all important as it started me on my love affair with wood and the beauty which can be created on the lathe". Dennis was fortunate to have an engineering father who built a lathe and this allowed him to maintain an active interest until he moved to Cape Town. There he was able to build his own larger lathe for the princely sum of $45. He used this lathe for 20 years but it was retired in 1999 when he succumbed to the temptation of a Oneway 2436. Dennis spent 10 years in Hong Kong where he became known as the 'Typhoon Turner' because all his wood was collected as the result of the many typhoons which blow through that area. Dennis moved to the USA in 1998 and lives in the beautiful rolling hills of Mendham, New Jersey, USA surrounded by the majestic trees of the North East, which he uses for his works: "I create my pieces in my home basement studio" he tells me. From perusing Dennis' website, I became more familiar with his body of work and was eager to find out more about the inspirations behind them. He informs me that his work has taken many turns over the years, but a few consistent themes are evident. The first is what he calls classical hollow form vases. Here his focus is on aesthetically pleasing forms, great curves and finials that work with the piece: "In this same theme there are pieces where it is impossible to tell how the piece was hollowed out by disguising the entry hole in the bottom or via decorative grooves at the top and matching the wood grain exactly", he comments. The second theme is what he calls 'root form'. Here he lets nature dictate what shape and feel the piece will have. An extension of this is what he calls 'Windows into Wood' where he combines the vase form, but uses the openings which nature provided to allow the viewer access into the piece and adds that element of wonder and exploration: "In many cases the work that the tree started is augmented by the attention of worms and ants, the voices of all the creatures of nature are respected and add to the beauty of the final piece'. The next theme is what he called 'Canvas Irreverence'. Dennis was fortunate enough to spend a week at the Arrowmont School of Art with Jack Slentz, who taught him to take beautiful wood and treat is as a canvas on which to create his own artistic impressions by burning, carving, colouring, sand blasting and generally mutilating the wood to his artistic satisfaction. Many of his platters focus on the planets in the universe, which allows his mind to travel to distant places. As Dennis says, "After a tough day working in the pharmaceutical industry, it is great to let your mind wander and contemplate the vast beauty of the universe and all the creatures that inhabit it. It is by taking time to wonder and dream that some of my best works have materialised". Another theme is what he calls 'Multi Level Wonders' which takes all his technical expertise to create multi-level deep hollow forms and then use them as canvasses to create and express his view of the world. His darkest piece by far was created during the Afghanistan war when there was a lot of talk about elaborate cave complexes and weapons of mass destruction. Unsurprisingly, the piece has three levels and inside there is a long range missile that lights up the cave at each stage. The cave is equipped with all the bells and whistles such are solar power, defensive missiles and radar detection. Commenting on this piece, Dennis admits: "This piece reflects a lot about what was happening in my life at that time; I was between jobs and all the news was about the war in Afghanistan and the Axis of Evil. Many of my real breakthrough pieces come from telling the story of life around me". Another piece on the lighter side of life is call 'Ye Mine of Old' - this piece once more has lights in both levels and an operational hoist for winching up pieces of tiger's eye - a semi-precious stone. This one is a great hit with the younger minds. I asked Dennis how long, typically, it takes him to complete one of his pieces and he comments that, obviously, so much depends on the piece: "If it is a very thin piece, like a hat, then you need to get the main turning complete within about six hours while the wood is wet, after that it is all about bending and finishing, which can take a full day. The more complex pieces like the jewellery busts require about five hours of turning and then days and days of carving," he explains. of them inspire growth in his career. "To have someone like Graeme Priddle or Jack de Vos in my studio working on one of their pieces and talking about their lives over dinner is truly inspiring. It really puts into very clear focus the dedication it takes to be an artist using wood as a medium". He also travelled to the UK where he did his first formal course with Dave Regester and was able to see some of the top UK turners, such as Bert Marsh and Ray Key in action at the Axminster shows. In Dennis' opinion, the annual AAW Symposium and the instant gallery is also a very inspiring and, at the same time, a humbling experience, as every year, the artistic envelope is being pushed to the limit. Dennis says that over a 40-year period of turning, his work has taken many turns and because his work in the pharmaceutical industry pays the bills, he can allow his creative mind to take his turning in many different directions, from utilitarian items to highly involved artistic creations: "Over the years my own voice has developed and some of my planetary platters, windows into wood vessels and multi-level wonders have set my work apart". In terms of describing his turning style, Dennis comments that this is akin to herding cats, as his mind is always sparking with new ideas. He comments that he is working on about 20 pieces at any given time, all in various stages of creation. He is currently including mixed media, lights, colours and stories into much of his work. Growing up in South Africa had a big impact on Dennis' work and his early influences were from Commonwealth turners such as Bert Marsh, Dave Regester, Dennis White, and those whose full video tape series he watched many times. Dennis recalls, "Most of my early influences were from the British turners. I subscribed to Woodturning magazine from almost the very first issue. This magazine kept me connected with the world during some very lonely years in Hong Kong". 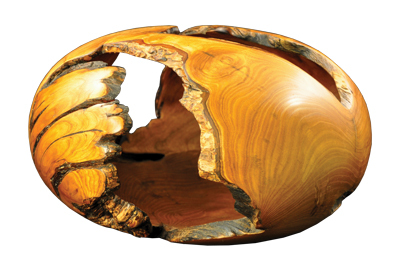 Dennis also says that he will never forget the first real woodturner he met, in Bulawayo, Rhodesia in 1974: "He was a lovely old gentleman, who only had one arm and he produced the most fantastic segmented work I had ever seen; that was a big inspiration for me". On coming to the USA in 1998 there were many great influences such as Johannes Michelson, Elvie Jackson, David Ellsworth, Frank Sudol, Al Stirt, Michael Hosaluk, Peter Bloch, Trent Bosch, Dennis Elliot, Jack de Vos and Graeme Priddle - just to name a few. Dennis comments, "I have never met such a warm and giving community as the woodturners in America". Dennis' studio, as he likes to call it, is located in the basement of his house. Looking at the workshop you can see that it has a single minded focus on woodturning. The lathe area is partitioned off with sliding see-through plastic doors to contain the shavings and dust in what Dennis calls the 'dirty area'. Outside this is a large area for bench work and wood storage. The basement is accessed either from the dog room, or from the back garden, where he stores all of his wet wood. 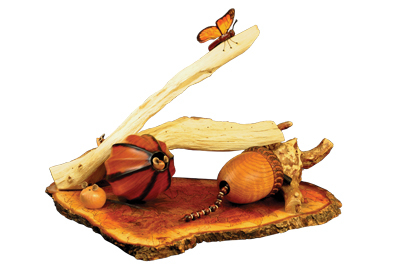 In terms of work ethos, talking to Dennis you quickly learn that he leads a double life - that of pharmaceutical executive and artistic woodturner. After 40 years, he has managed to get the two to live in perfect harmony. As he says, one day when he is 90-years-old and reflects on his life, he will know that he lived it to the full and maximised every opportunity that it presented. Most weekends are spent in the studio either turning or teaching, according to Dennis. In terms of special tools that he could not do without, Dennis explains that the tool which he finds indispensable is the 12mm deep fluted bowl gouge - normally a Henry Taylor. As Dennis says, "This is the real workhorse for most of my work and then for deep hollow work, I rely on my homemade boring bars, especially when creating multi-level pieces". One simple tool that is critical for making a good tenon is what Dennis calls his 'broad slightly angled scraper' for getting an inward sloping angle on the wood next to the tenon, so the outside steel or face of the chuck jaws makes contact with the wood: "In all my years of teaching this one simple tool saves beginners a lot of frustration with wood flying off due to broken tenons". As Dennis explains, "There have been a number of high points to my woodturning career, most of them occurring when I had a big breakthrough in my artist expression; the opportunity to attend the Arrowmont School of Art and work with Jack Slentz was one big turning point. Prior to his influence I allowed the wood to do most of the talking, after that experience I would take a beautiful burl and basically mutilate it with chain saws, carvers and burners until I had placed my own artistic marks on the wood', he tells me. The lowest time in his career was moving to Hong Kong, where he lived in a high rise apartment for the first four years and could not work on a lathe. Also, Dennis was the only woodturner, so it was a very lonely time: "My only outside turning stimulation came from Woodturning magazine that I would devour from cover to cover. This contrasts very sharply with the move to the USA where there is so much encouragement from other turners,' he finishes. When I asked Dennis what he thinks the best thing about turning is, he explains that he has become a very popular demonstrator at venues in the North East including Totally Turning, Peter's Valley Craft Centre, and many of the AAW Chapters. One of the demonstrations which Dennis is well known for is the identification of the woods of the North East, USA. He gets the audience to identify about 14 different logs and then describes the properties of the wood and shows the various items that can be created from these wonderful trees. He calls the demo 'From Road Kill to Lathe' and it underscores Dennis' belief that there are more fallen trees in the North East than all the turners in the AAW could turn in 100 lifetimes. As Dennis says, "You just need to have the patience to rescue the wood from the landfill or fireplaces. I cut almost all my own wood, as that way I can get exactly the orientation and dimension I need for my pieces. This is especially important when creating 'Windows into Wood' or 'Multi Level Wonders' as you need to be very aware where the natural voids in the log are". Some of Dennis' best woodturning moments have come from teaching others: "To hear the words, 'That was the best demonstration I have seen in my life' really gives me a thrill and makes all the preparation for a demo worthwhile", Dennis explains. When I ask Dennis about his woodturning future, he comments that his turning passion is very clearly heading in two clear directions. Artistically, he is exploring the inclusion of many more texturing, carving and alternative media ideas. His jewellery busts are a very new avenue where he uses the lathe to do some simple hollowing and then does a lot of carving. Teaching is the second direction where he is expanding his range of demonstrations, whilst looking to do a lot more publishing, both on the internet and in the form of books and DVDs. Dennis has a very structured view of the future: "The disciplines of being a corporate executive have served my artistic career very well in that I lay out a long range plan and then try to achieve it. The next five years have the following goals: create two new themes with three definitive pieces in each; get one book/DVD on the market; add one new cutting edge demonstration to my selection and have more fun than in the past five years". We are sure that Dennis will achieve these goals and we wish him all the best for the future.